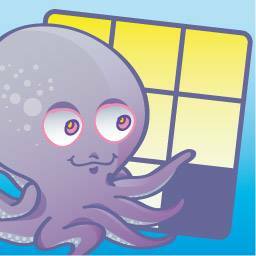 When we decided to create our first game Octopuzz (available for iPhone, iPad, and Android devices) we had several goals in mind. As we didn’t have experience on the business part of selling digital games for mobile devices, one of our goals was to create a very simple game, finish it as soon as possible, and learn with it all the tips and tricks of the App Store and Google Play. But at the same time, we didn’t like the idea of making a new Flappy Birds clone, but to make a game with some pedagogical value. So we decided to create the classic Sliding Puzzle game, reduce its size to 3×3 tiles (an 8-puzzle) and modify the game mechanics to add some educative value. The pedagogical goal of Octopuzz is the development of problem-solving strategies in the player. More specifically, achieve the intuition of the “divide and conquer” problem-solving strategies by the kid, where a hard problem is reduced to a smaller and simpler problem for which we already know de solution. To achieve this goal, Octopuzz presents puzzles of increased difficulty to the player, beginning with a puzzle with a “one movement” solution, following with another puzzle with a “two movements” solution, and so on, until we reach a limit (a “ten movements” solution puzzle) that we consider hard enough for 10-11 years old kids. How can we help our kids to achieve all this pedagogical goals when playing Octopuzz? First we need to know the problem-solving strategy that is used to solve this kind of puzzles: if we put all the top row and leftmost column tiles in their correct position, we have reduced the problem to another with one row and one column less, because the ordered row and column don’t need to be moved again until we find the solution to the whole puzzle. In Octopuzz this means that we always begin by ordering the top 3 tiles and then the remaining 2 leftmost tiles (or the other way around, beginning with the column). That left us with 3 tiles to order (plus the hole), a very simple problem. Second, we need to understand that this kind of strategy is hard to explain to a 7-11 years-old kid, because they are not going to understand the kind of abstract thinking that we are going to use in our explanation. But that doesn’t mean that kids this age cannot get the intuition of this strategy, specially from its practice. The capacity of solving problem is a very important ability in the development of a human being, not only in scientific or technological fields, but in any area. I hope that Octopuzz and this tips will help your kids to develop this capacity.